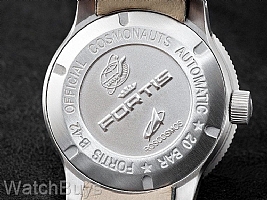 The trip was to the Russian Space Station MIR, and the results were so positive that the decision was made to "launch" an Official Cosmonauts Collection. The Fortis Official Cosmonauts is housed in a 42 mm case with a matte black dial and contrasting white numerals and indices. The seconds hand is painted in orange for clear legibility. 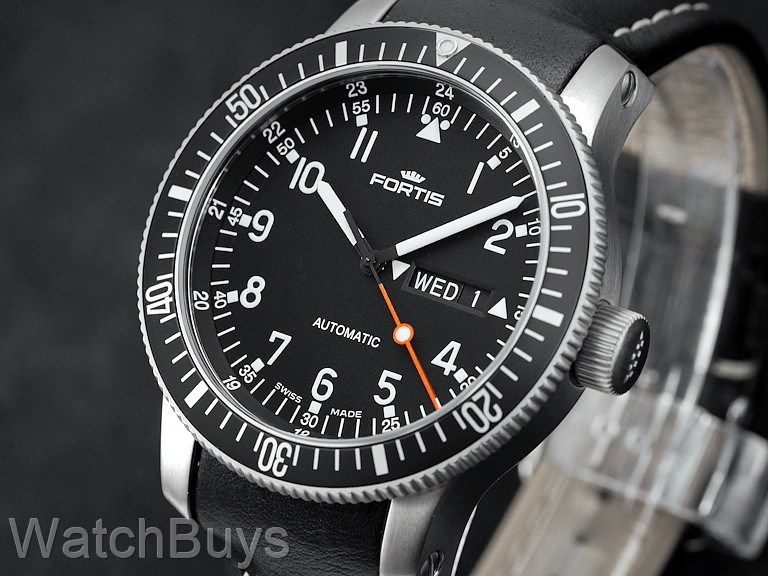 This watch is fitted with a Fortis black calf leather strap with white contrast stitching and Fortis steel tang buckle. Verified Owner Comments: F.O.C outstanding solid watch, looks similar to Sinn 104. I believe they use ETA 7750 Valjoux movement . Watch sits very well on my 6.75 inch wrist. It has lots of masculine presence so be ready to get noticed and complimented. Leather strap feels cheap so i replaced it with rubber strap. This watch def a keeper. Verified Owner Comments: This was my first purchase from watchbuys and it was a great experience. This watch presents a superb value for money. A strong and classy watch with a tried and true Swiss ETA movement from a watchmaker with history. I have owned my Fortis for 2 years and it has been flawless. I have worn it in all conditions, from the beach to dinners and even with a suit on a job interview. It never fails to get compliments and questions. This watch would be a fantastic place for a new watch collector to start or an experienced collector to add a new and interesting piece. Buy with confidence. Verified Owner Comments: Beautiful watch! I've received good comments on it. Really nice build and the watch face is so professional! Verified Owner Comments: Great watch. The watch is very well made with great illumination. Easy to read day or night. Strap runs a little small on my wrist. Very pleased with service from WatchBuys.